as an example, as it was found routinely in isolates from Hawaii (Yang and Griffiths 1993; Maas et al. 2005), but less frequently in Asia, Africa, Central America, and South Pacific islands (Arganoza et al. 1994). In Claviceps purpurea and Blumeria graminis, linear plasmids occur frequently irrespective of their geographic origins (Tudzynski and Esser 1986; Düvell et al. 1988; Giese et al. 1990, 2003), being indicative of a widespread distribution in these fungi. Partial or entire nucleotide sequences are available for a considerable number of linear plasmids from both filamentous ascomycetes and basidiomycetes (Table 1). Sizes vary from 5142 bp (pAI1 of Ascobolus immersus) to 9879 bp (pMLP1 of Pleurotus ostreatus); all of them possess TIRs ranging in size from 327 to 1365 bp (Table 1). Most known linear plasmids from filamentous fungi display a rather common genetic organization as for the maranhar plasmid from Neurospora crassa (Fig. 2), which contains two ORFs in an inverse orientation encoding the TP-DNA polymerase and the RNA polymerase, respectively. However, differently organized plasmids exist as well, such as pAI1 of A. immersus and pMC3-2 of the morel, which encode the typical TP-DNA polymerase fusion gene but lack an RNA polymerase gene (Kempken et al. 1989; Rohe et al. 1991; Fig. 2). In both instances the plasmids concomitantly exist along with other elements, suggesting the RNA polymerase to be encoded by an accompanying plasmid. Such a scenario has indeed been proven for the linear plasmids discovered first, i.e., the S plasmids S1 and S2 from maize (Levings and Sederoff 1983; Paillard et al. 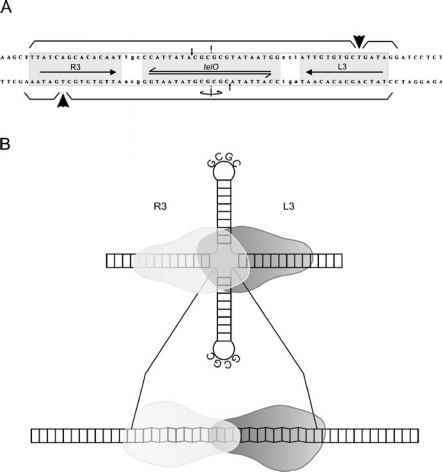 1985); S1 encodes the TP and DNA polymerase, while the RNA polymerase gene is located on S2.